Women's Ordination Worldwide Action Alert: Send your letter to Pope Francis asking that official discussion about women's ordination be opened. Pope Francis: a new era? May 22, 2014 will mark the twentieth anniversary of John Paul II's Apostolic Letter Ordinatio Sacerdotalis in which he attempted to officially ban discussion about the ordination of women. Women's ordination advocates remain mindful of Pope Francis's well expressed wisdom that, 'Dialogue is the only way for individuals, families and societies to grow, and that the Church should not be afraid to re-examine customs when they no longer serve as a means of communicating the Gospel.' Women's Ordination Worldwide encourages people to keep speaking out. Closing dialogue when there has been none does not show a way forward to growth. A male only priesthood is a custom that is neither consistent with Christianity nor has it ever served as a means of effectively and fully communicating the Gospel. You may wish to reflect on these alone or gather as a group to share thoughts. Participants may take turns reading Pope Francis’s quotes aloud and reflect on how the quote personally affects them and/or their church community. Please use this resource list as guide to further explore the question of women’s ordination. Hanna, Erin Saiz, Why keep women out of the priesthood? Osiek, Carolyn and Margaret MacDonald with Janet Tulloch, A Woman’s Place: House Churches in Earliest Christianity, Baltimore, MD: The John Hopkins University Press, 2005. Torjeson, Karen Jo, When Women Were Priests: Women’s Leadership in the Early Church and the Scandal of Their Subordination in the Rise of Christianity, New York: Harper Collins, 1993. Madigan, Kevin and Osiek, Carolyn, Ordained Women in the Early Church: A Documentary History, Baltimore, MD: The John Hopkins University Press, 2005. Do you think women should be ordained in the Roman Catholic Church? Why or why not? How has/hasn’t the church changed during Pope Francis’s papacy? What priestly gifts do you possess? How do you answer your baptismal call? 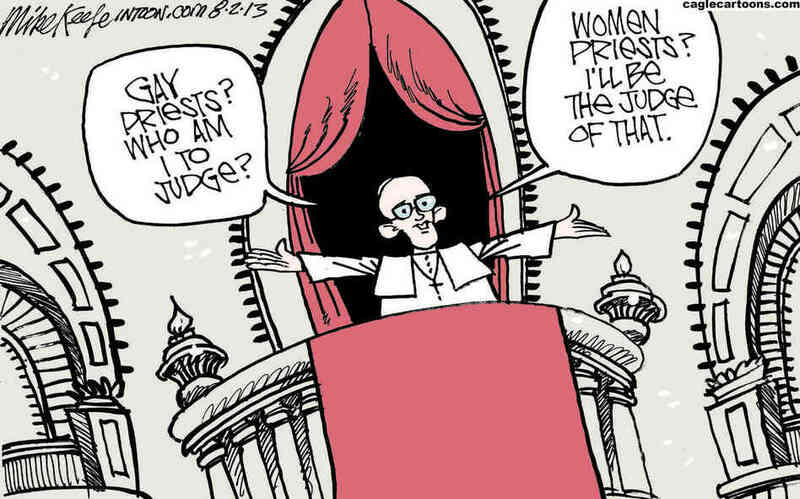 How would the Roman Catholic Church be different with women priests? How would it be the same? What structures within the priesthood and the church need to change to allow for a renewed priesthood and renewed church where all are equal, liberated from oppression, and nourished spiritually? What do you think of women who are moving beyond Roman Catholic structures to be ordained in Roman (or other) Catholic faith communities? who recognize that women, like men, are not only created in God's image but are also called to serve all God’s people in all ways, including holy orders. A delegation of women’s ordination advocates from around the world will, during prayerful vigil hand deliver these letters to the Vatican -- letters from women who are called to priesthood and from all those who stand up for justice in the church. Send your letter by May 15, 2014 online by filling out the form below. You can submit your letter in the language of your choice. Visit www.womenpriests.org for translations of this action alert into a variety of languages. All are one in your image. and especially in our churches. Let us use our voice to speak truth about justice and equality. Let us celebrate the gifts of all God’s people. Give us hope for the future of our renewed, justice, and equal church. What does it feel like to be excluded from priestly ministry in the Catholic Church?